January is a notoriously harsh month weather-wise. But that doesn't mean you should be spending it hiding out indoors—whether you're interested in art and design, theater, film, or food, there's something that should pique your interest. Here are eight of the best January events in Toronto. It might be cold outside in January, but it’s well worth bundling up and making your way to the historic Distillery District to check out Toronto Light Festival. The already charming area, filled with Victorian-era architecture along cobblestone streets, sees local and international artists use light as a medium, transforming the Distillery District into a stunning light show covering over 13 acres. The event is free to attend. 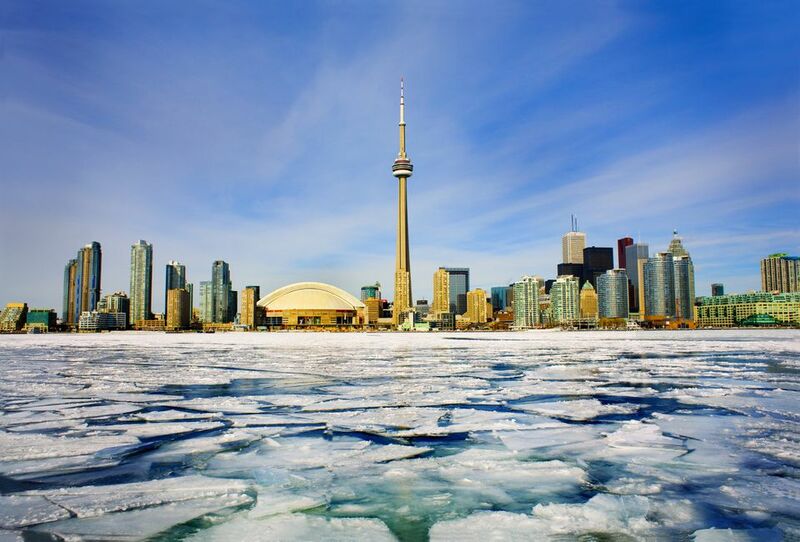 Make your way to the West Island of Ontario Place for all kinds of winter-based fun. Lace up some skates, and skate your away around the synthetic rink set against the shoreline of Lake Ontario. If you don’t have skates, rentals are available. In addition, you can see more light-based art installations at the Winter Light Exhibition. When you get cold, warm up at the bonfire area just a short distance from the skating rink. In addition, 180,000 fairy lights will be illuminating over 150 trees along the paths of the Winter Light Exhibition. Produced by the Toronto Fringe, Next Stage is Toronto's premiere winter theater event and one that acts as a platform for past Fringe artists to take their work to an even wider audience. You can expect a lineup of companies showcasing some of the best indie theater talent from Toronto and beyond, from comedy ensembles to solo shows. Most of the fun takes place at the Factory Theater in the Mainspace, Studio, and Antechamber. Tickets are $15 for Mainspace and Studio shows (60-90 minutes), and $12 for Antechamber shows (30 minutes) and can be purchased online at the Toronto Fringe website or by phone at 416-966-1062. The Enercare Centre at Exhibition Place will be home to Toronto's annual International Boat Show this January where there will be something for everyone, from beginners to seasoned boaters. In addition to educational seminars, new product showcases and hands-on skills training, there are some fun special features to check out including the indoor lake, which happens to be the world’s largest indoor lake for boaters. The lake will be the site of various demonstrations and events, and you can even take a free canoe or kayak ride. From January 18 to 27, DesignTO (formerly the Toronto Offsite Design Festival) brings design out of the studios and workshops and out into the open for the city to enjoy. This year’s fest, Canada’s largest cultural celebration of design, will bring over 100 exhibitions and events across the city at numerous venues across the city. Venues can be anything from an exhibition displayed in a store window to a large scale installation in a gallery. The Gladstone Hotel will once again be putting on its annual design event, now entering its 16th year. The popular event is happening in conjunction with DesignTO and the Interior Design Show (IDS) with over 20 projects and over 50 participants featuring Canadian and international artists and designers. Come Up To My Room is happening January 17 to 20 and will showcase the work of both established and up and coming artists, designers, and collectives and takes place over three floors of the historic Gladstone Hotel. Installations throughout the space are meant to encourage more than passive viewing and instead inspire new ideas and spark dialogue. If you need inspiration for your next interior design project or just want some tips on sprucing up your home in the coming year, a trip the Interior Design Show should provide what you need. The Interior Design Show, happening at the Metro Toronto Convention Centre, is now in its 21st year and continues to showcase both renowned and international brands and designers in seminars and exhibits that introduce guests to some of the best the design world has to offer. It might be cold outside, but eating at some of Toronto’s best restaurants for well-priced prix fixe menus courtesy of Winterlicious should be enough to draw you out of hibernation. More than 220 restaurants will be serving three-course meals for lunch or dinner from January 25 to February 7. Whether you’ve never been, haven’t been in a while or go every year, Winterlicious continues to be a big culinary draw in the city and a good way to try a few new restaurants. Three-course prix fixe lunch and dinner menus are offered at $18, $23, or $28 for lunch and $28, $38 or $48 for dinner at restaurants all over the city.